So now I have an armadillo on my blog. The truth is, I’ve always had a soft spot for armadillos. While I love animals of all kinds, including the creepy crawly stuff most people avoid, armadillos are one of my favorites. Just to show you that my armadillo thing is for real, I’ll be posting pictures of the armadillos in my life. Here’s the first one. It’s an armadillo I made years ago when I learned how to make 3-D animals with wire and beads from the book Beaded Animals in Jewelry by Lette Lammens and Els Scholte. As soon as I got the hang of it, I began playing with the patterns in the book. 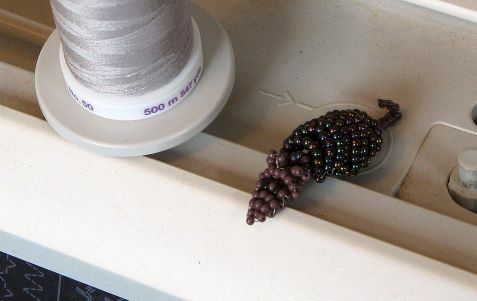 To make an armadillo, I just changed the bead colors on the standard mouse pattern. It made more sense to me as an armadillo anyway since you can’t see any feet. This little guy has no name, but he lives on my sewing machine. He’s my good-luck sewing mascot and keeps me company while I work on quilts and other projects. He’s just 2 inches long. And as a bonus, check out this little guy at Cute Overload. Awwwwww!